One of the most rewarding types of patients to have is someone over fifty with a stable financial situation and the desire to finally invest in their oral health. There are many advantages to more mature patients, not least of which is their openness to complex care such as veneers. A large swath of patients over fifty also have quite challenging restorative, esthetic, and functional needs. Long years of grinding, clenching, poor oral hygiene, and inadequate dentistry take their toll. The upside is that these patients also genuinely appreciate the difference a beautiful, healthy smile makes in their lives. Their gratitude is humbling and inspiring. That’s exactly what happened in one of my recent cases. 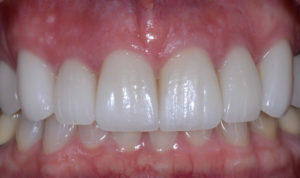 A 66-year-old female patient presented to my office with old anterior veneers. So often I see patients who have gone through the wringer when it comes to prior dental work. Most of the time, what they need is a thorough, holistic consideration of their occlusion, function, and overall needs. That kind of depth can’t be rushed. Several of the patient’s veneers had debonded and had to be put back on. There were also multiple cracks that had to be addressed by treatment. 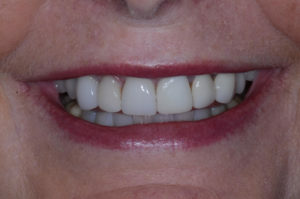 The patient was enthusiastic about updating her restorations so that she could return to normal confidence in her smile. For this case, I collaborated with Gold Dust on new Ivoclar Vivadent IPS Empress veneers. This was a relatively simple solution that covered teeth #6 through #11. Empress gave us great shade-matching and the benefits of high glass-ceramic flexural strength. I wanted to ensure the patient wouldn’t have to come in for repairs for a very long time. My patient was pleased with the final result. It was one of those situations where everything proceeds smoothly right from the start. Have you had any recent interesting cases involving veneers? We’d love to hear from you in the comments!